Today we have cats in a state of nature. Of course, “state of nature” for a housecat means endless brushing, pampering, soft beds to sleep on, and a bottomless food dish. So this is as close as we get. 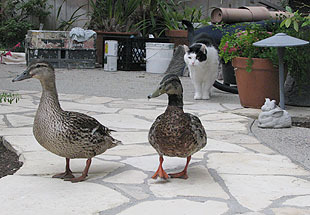 On the left, Inkblot is trying to figure out why there’s a pair of ducks in his backyard. Answer: they waddled over from the lake and are probably looking for suitable nesting grounds. Having a pair of cats around isn’t likely to be on their “must have” checklist, but I think they could do worse. In fact, our cats are not only too dumb to pose any real danger, Inkblot in particular is dumb enough that they might be able to fool him into incubating their eggs for them, Horton-like. The eggs might come out a little the worse for wear, though. 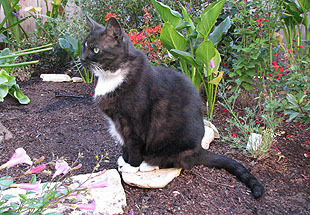 On the right, Domino is surrounded by wild foliage in the dark interior of our front yard garden. That’s nature red in tooth and claw, folks. UPDATE: More MoJo catblogging here!